Inspired by art designs from India, the Alexandre Turpault Namaste duvet and sham collection is elegant and sophisticated. Available in choice of three subtle and delicate colors; Mink, Silver, and White. Just fabulous! Adorned with velvet applique, the Lili Alessandra Vendome duvet and decorative pillow are not only radiant, but also easy to care for in a washable silk-like fabric. Simply sophisticated! Every once in a while you come across something that takes your breath away and this is it! The exquisite SDH Paros bedding collection, a perfect blend of 60% Egyptian Cotton and 40% Linen, provides lasting comfort and timeless beauty. Includes a duvet, sheets, cases, shams, and bed skirt. 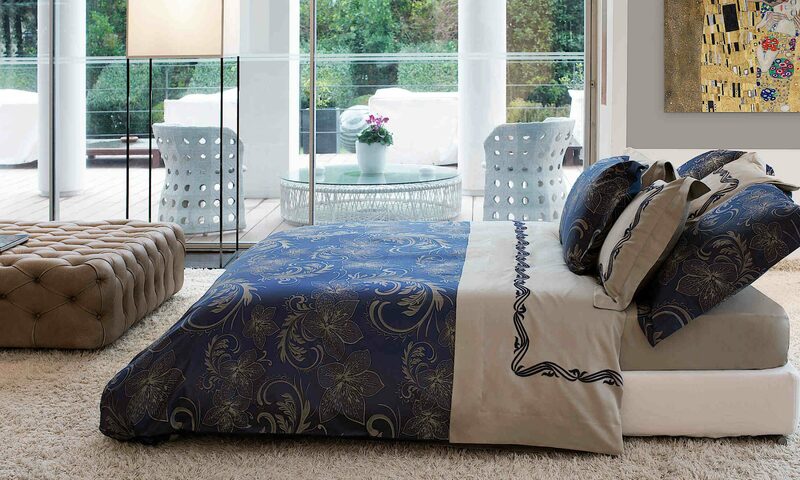 Indigo coordinates include Kimi boutis coverlet and shams and Pavia sateen sheeting. This stunning Lili Alessandra Versaille bedding ensemble in Ice Blue velvet with Ivory velvet applique is reminiscent of a classical French painting. A collection of decorative pillows, quilted coverlet, throw, and bedskirt gives some versatility to dressing your bed. Luscious and dreamy, don’t you think?